It was a case of second time lucky for Simon and Joanna Craddock who first tried to buy their Victorian home six years ago and narrowly missed out. When it went back on the market four years later nothing was going to stand in their way, and without even looking inside they knew it was the family home they wanted. 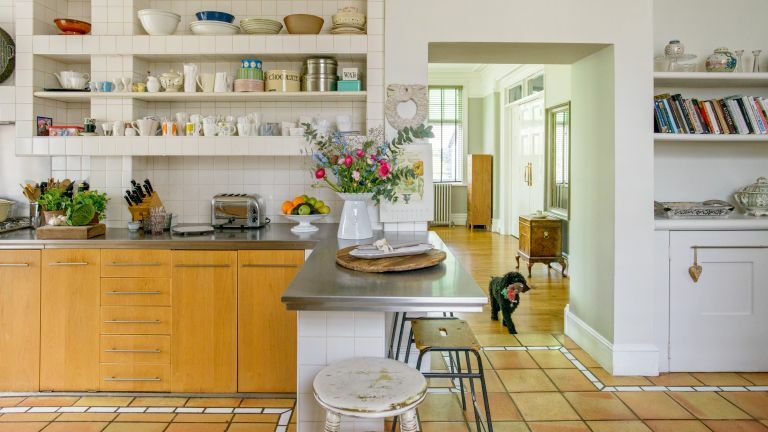 The handsome double-fronted property is on a quiet road near one of London’s Royal parks, with a traditional black and white tiled path to the front door. The inner door's original stained glass panels filter light into the wide hall, while the generously proportioned reception rooms with high ceilings give a sense of space. The house was full of built-in cupboards and wardrobes, added in the 1950s, and the decorating was dreadful so Joanna ripped it all out, along with the carpets. Fortunately, the floorboards, woodwork and striking tiled path were all in good condition. The couple took most of the rooms back to bare plaster and had the floorboards stripped and polished, before an army of decorators spent three weeks painting the rooms from the top of the house downwards. Because the fabric of the house was in good condition the main task for Joanna was its interior design. As a former manager of boutiques in Bristol and Bath, before spending seven years in management with Harrods' fashion floors, she approaches interior design and decorating with considerable flair. As the family all lead busy energetic lives Joanna’s aim was to make the house an oasis of calm using a palette of blue, beige and neutral colours with natural fabrics and splashes of relaxing green and gold.’ A perfect example is the front sitting room. 'This room is our quiet room for chatting and reading, and I’ve given it a modern twist on a Victorian library mood,' says Joanna. 'We have had the caramel leather Heal’s sofa for 14 years and its lived-in feel suits the room.’ Cushions and throws add to the relaxing atmosphere. The oval back chair isn’t the only family treasure on display in the dining room. ‘The square antique walnut chest with brass handles also once belonged to my grandmother and I love it. It has a lid that lifts to reveals compartments and was used for storing documents,’ says Joanna. It looks quite at home alongside Joanna’s vintage dinnerware, Astier de Villatte, handmade in Paris. ‘It combines durability with a design that is earthy yet elegant. It looks sophisticated on the modern formal dining table and takes on an almost rustic appearance when used in the conservatory. It's also tough enough for everyday use at the kitchen table or breakfast bar,’ says Joanna. Joanna loves to cook and spends a lot of her time either in front of the Aga ensuring her family are well fed, or sitting at the kitchen table planning her interior design schemes. She says they may eventually update the units and worktops, but have no plans for any major modernisation in the rest of the house.